It’s day one of the 2018 Stockholm Tap Festival. A few of us faculty members are walking back to the hotel when Dormeshia Sumbry-Edwards says, “How much did he pay?” “Who are we talking about,” I responded. “Bill.” Then she sang the tune, and I remembered the clip (below). I could sing the melody but couldn’t remember how much he paid. I went to sleep that night while Dormeshia (and Nico Rubio), investigated. “Five dollars.” This was now Friday. Saturday began and the theme continued. We would pass by each other and someone would ask “How much did he pay?” or “Have your got your five dollars?” It was like a running gag. Saturday night was the faculty demo at the All Styles Battle. Every member of the faculty would dance a few minutes in between one of the rounds of competition. Below is a bootleg of my performance. I begin with a quote from a piece I originally choreographed for Cats Paying Dues call 6ix. At about 00:47 I hiccup. You can hear me react. The thing I was reaching for wasn’t there. I start recovering from the mental slip. At just that moment Dormeshia says, “How much did he pay?” I respond, “Five dollars” With my hand in the air (hard to see in this bootleg), a new thing happens, and I finish the set. Then there is laughter. Who knew that would be my response to the question? Who knew tap dance trivia could trigger expression? I sure wasn’t expecting it, but I’m glad it happened. During a week in the spring in 2018 I traveled to get together with my Holler Jake bandmate Evie Andrus to experiment with the combination of tap dancing and fiddle tunes. The videos were released weekly on Holler Jake’s facebook page, and are now available for your enjoyment on my portfolio page here. Back in January 2017 I wrote about the TiltBrush Artist in Residence program, and some of the work I produced while there. The idea of combining tap dance and virtual reality is very new. It’s so new that when I was invited to produce a 360 video to celebrate a recent collaboration between Google Arts and Culture and Deutsche Grammophon, I wondered if anyone else had already done something similar. 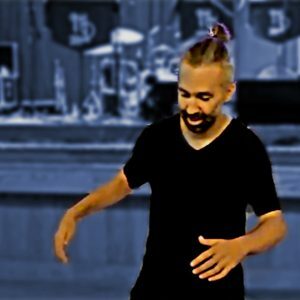 While many other dance companies have experimented with 360 videos, I’m so happy to have partnered with Windrider Institute to produce the first 360 video of a tap dancer. Check out the complete video in my portfolio here. Use Google’s cardboard to get the full virtual reality experience.